I thought the word "saved" was replaced with "published" recently. I see most of the messages reflecting the change except the success message of VE. It still shows "Your edit was saved." and not "Your edit was published." TheDJ triaged this task as Normal priority. GeoffreyT2000 added a subscriber: GeoffreyT2000. 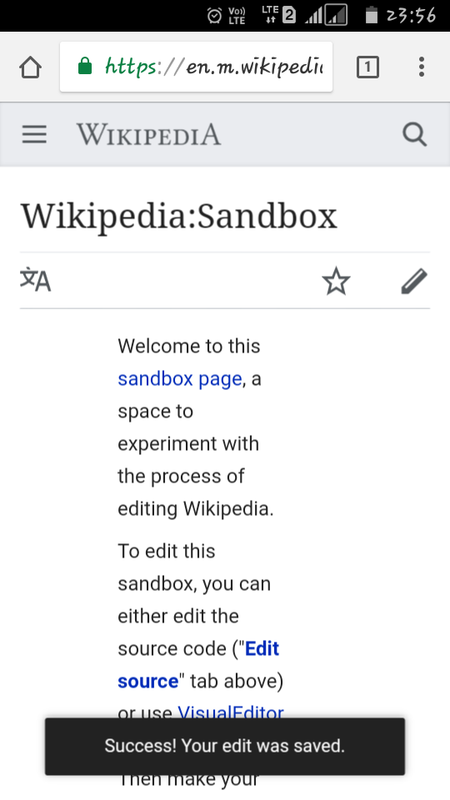 When I save an edit on Wikipedia, it still says "Your edit was saved", not "Your edit was published". I am thus reopening this, which needs a more careful patch to be actually fixed. Changes to code do not take immediate effect. Tasks are closed as resolved when the code is merged and will be automatically deployed. The change will go live next week. Please ignore my above comment. I completely misread the ticket. @GeoffreyT2000 is right; this isn't working, and it should be. The below screenshot is from the English Wikipedia. DLynch moved this task from Ready for Pick Up to Code review on the VisualEditor (Current work) board. DLynch added subscribers: Jdforrester-WMF, DLynch. This is the postedit-confirmation-saved message, which needs to get adjusted to postedit-confirmation-published in a few places. Patch handles the VE cases. There's also resources/src/mediawiki.action/mediawiki.action.view.postEdit.js which uses saved directly, if it's the value stored in the wgPostEdit config, which the classic EditPage setPostEditCookie does. Since that's entirely an old-editor path, I think, should it be updated as well or left alone? I just noticed we haven't changed the wording of post edit notification for mobile VE to be "Published". Shouldn't we change it there as well? This task was always about desktop because of the description, so this is resolved now.